Here’s the thing about me and naps: unless I’m vomiting or up all night with someone who has been vomiting, I suffer tremendous guilt about the nap. I mean, I don’t DESERVE the nap. Next to a full-body massage and salt scrub in an expensive day spa with fluffy white robes and iced cucumber water, naps are the most self-indulgent and frivolous activity on the planet. Or so my guilt-ridden brain tells me. I lie there trying to combat the guilt with logic. I tell myself I’ll feel more energized and be more productive when I wake up from the nap. I will remind myself of all the hard work I completed thus far and all the hard work I will complete when I awaken. I will set an alarm so the nap is brief. I will tell myself that I probably wasted more time indulging in mindless crap on the Internet already that day, than I would be spending on the actual nap. I’ll calculate the number of hours I’ve already been awake and then number of hours I have before I can possibly go back to bed, and think through the proportions of hours awake to hours asleep. It’s exhausting living with this brain. No wonder I need a nap! I realize not all of you have the luxury of taking a mid-day nap. It’s definitely a perk of the stay-at-home/work-from-home-mom job description. (If you work away from home, you get other perks—like money. So, it all evens out in the end.) And some of you hate naps. You wake up cranky and more tired, and it’s just not worth it to you. But this post is not really about naps. It’s about the guilt surrounding rest. I want to make a definitive statement, right here, right now: Your body needs rest. The daily, high-quality kind. No matter whether you work at home or away from home, first shift or third shift, days, nights or weekends, you need rest every single day. Everyday balance requires both work and rest. God designed it that way. This is both scientific fact and scriptural truth. It’s logical and practical. And if you enjoy naps, like I do, it’s also rather enjoyable. So, let’s stop this guilt-for-resting nonsense. Agreed? 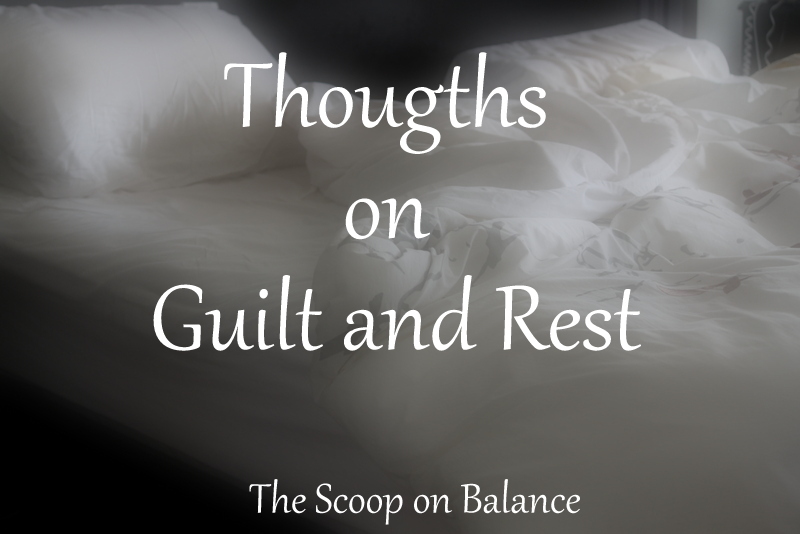 Buried in my archives, I found the following post called Balance and the Guilt-Factor. It spoke so loudly to me today, that I wanted to include it here, as a conclusion to today’s post. So much of what we perceive as “imbalance” is just guilt. Guilt because we know we should be exercising, except we’re working all day. Guilt because we know we should be playing doll-house with our preschooler, except we’ve got to clean the bathroom. Guilt because we know we should be cooking at home, except the kids’ activities mean we’re in the car all evening. Guilt because we know we need a date with our spouse, except money is tight because we ate out all week. When we’re working, we feel guilty that we don’t stay home with the kids. When we’re home with the kids, we feel guilty that we don’t contribute financially to the household. When we’re cleaning, we feel guilty we’re not resting. When we’re resting, we feel guilty we’re not organizing. When we’re organizing, we feel guilty we’re not playing with the kids. When we’re playing with the kids, we feel guilty we’re ignoring the laundry pile. When we’re attacking the laundry pile, we feel guilty we aren’t addressing our spiritual lives. And when we finally sit down to address our spiritual lives, our entire to-do list life comes flooding into our brains—and with it, overwhelming waves of guilt that we have so much to do, but we are always doing something else. We’re always doing something wrong. Guilty feelings lead to an illusion of imbalance. 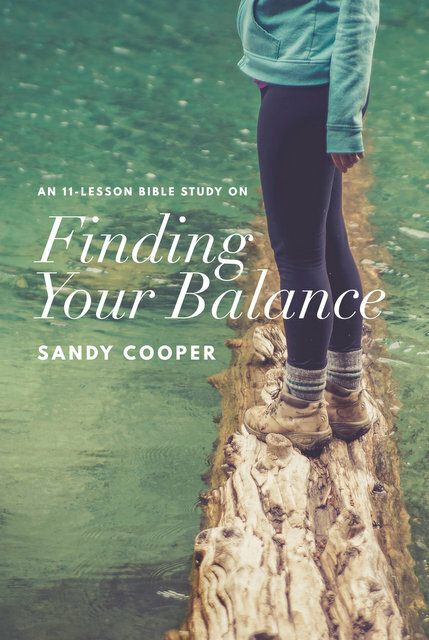 You may not be as imbalanced as you think you are—it’s just that you can’t see the balance through the guilt. What if, instead of nursing guilt feelings for everything you are not doing, you rested securely in what you are doing and focused on that? What if you knew—really knew—what you were supposed to be doing right now, today, this week? After the birth of every one of my babies. After the death of my son. The year we scraped every penny to fund my daughter’s adoption. I look back over that list and have to chuckle. 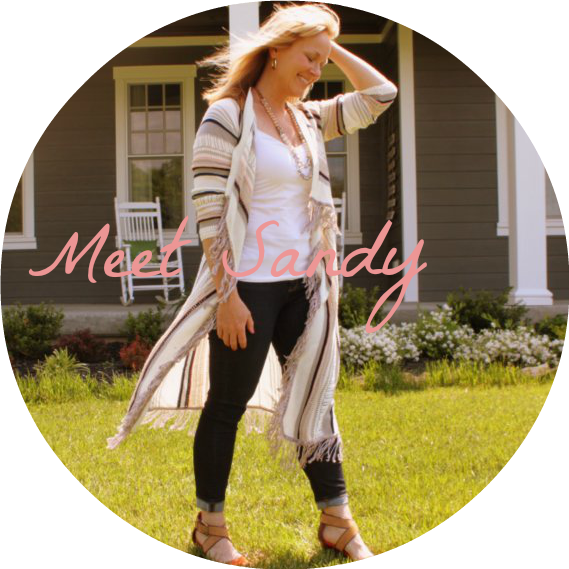 I can “feel” balanced while I’m surrounded by boxes in a new city or sitting in my sweats holding a feverish toddler, but I sometimes struggle with balance on an ordinary Wednesday afternoon. The circumstances of our lives don’t dictate balance. Resolving to focus on our priorities does. Distraction and balance are enemies. Keep vigilant watch over your heart; that’s where life starts….Keep your eyes straight ahead; ignore all sideshow distractions. Watch your step, and the road will stretch out smooth before you. Look neither right nor left; leave evil in the dust. Guilt-inducing distraction is especially powerful on ordinary days. The days when priorities are not as clear. When exercise, rest, cooking from scratch, eating out, tending to the children, tending to our home, me-time, God-time, friend-time, work-time, volunteer-time, computer-time and face-time all seem equally important. But there is a way to dispel distraction and guilt. Have you consulted Wisdom? Not just for the big things that show up every couple years, but for the hundred little things that show up every morning? Have you asked Wisdom what’s priority today? The answer you receive could be the key to your balance. I feel zero guilt at napping as of a few weeks ago. I am a poor nighttime sleeper, and as hard as the baby/toddler years were, I am finding that as I get older and am raising teen/pre-teen/mid-elementary kids, I am needing rest more than ever. I will say that I still harbor some guilt around 7pm when my brain decides to not function and that is the time of day that everyone else seems to come alive and wants to talk about deep thoughts…..still haven’t figured out how to solve that one!! !